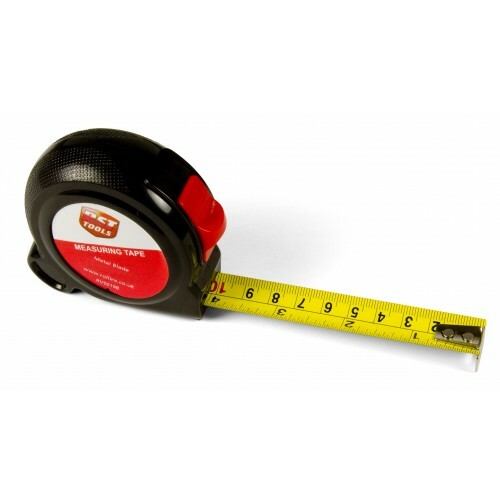 Our 5m/16ft Measure Tape in ABS Case is a tool that you'll use again and again. Designed to be both lightweight and durable, it is easily stored in tool boxes and pockets alike. When you need to take the most accurate measurement, this tape promises to provide accurate recordings. The outer case has been constructed from a lightweight and hard wearing ABS plastic. With its shatter-resistant properties and ergonomic design, it can stand sturdily on hard surfaces while you move around freely. A large red button built into the case allows the tape to be locked into place and released when it needs to be stored again. If we look at the tape measure itself, the bright yellow colour makes it highly visible in all light environments. We have printed both line and numerical markers along the 5m/6ft body, making it easy for you to record distance. These measurements come in cm/mm markings up to 5m and inch markings up to 6ft. In addition, every 10cm measure is printed in red to speed up the entire process entirely. Our professional quality measuring tools can be used by individuals of all skill sets. Whether you're working on a home renovation project or teaching younger students how to perform a job properly, this is the tool for you. Here at The Ruler Company, we have provided quality tools to hundreds of customers over the years. If you have any questions about this measuring tape or any of the other lines in our collection, contact us today.